3:30 PM Westin Bayshore – Grand Ballroom 1601 Bayshore Drive Reception and Trade Show: 3:30 – 7:00 p.m.
Come and meet fellow business people and network BUT KNOW THAT Exhibitor Information Booths are sold out. LEARN … MEET…. Sip and enjoy bite size canape treats! Breakout Sessions Speaker Schedule4:00 – 4:30 p.m. Closing tools to inspire buyers to say “Yes” again and again. FIND ME, Helena Kaufman, at this energizing event.. today I’ll be mingling and standing TALL in a big BLUE and very LONG jacket woven for me by a Vancouver Island artisan and businesswoman. Helena Kaufman actively shares secrets of messaging that sells, persuades, influences and connects people in person, online and in text. Vancouver-based storyteller Helena Kaufman helps professionals, entrepreneurs and companies discover the narratives that make them memorable. 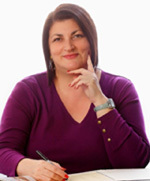 An award-winning communicator with over 25 years experience, Helena uses her writing and marketing skills to plan, produce and promote her clients’ projects.